In keeping with the proven Montessori approach, mixed-age groups in each classroom create the opportunity where students become each other’s mentors and teachers. The space is designed specifically for children this age to facilitate their learning from teachers, their peers, and their surroundings. The structured line time allows students the opportunity to learn how to listen and hear instruction before venturing on to their designated learning tasks. This is a life-long skill students of all ages will employ. Practical life – The key area of the classroom. All of the early learning begins here: dexterity, eye-hand coordination, shape and form recognition, matching, sorting, tracing, early counting, and many other “practical life” skills. Practical life work is also done in the kitchen with water pouring, polishing, washing and scrubbing activities. Sensorial – The study of shape, color, size, weight, texture is learned through the senses. Materials vary from large motor skill development to refined logical thinking work. The triangle boxes are a key part of sensorial, as are the study of puzzles, the five animal groups and the early botany work. 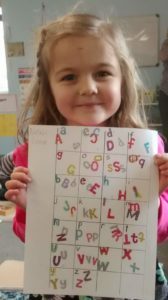 Language – Early language work consists of object boxes, which teach a child the name of each letter and the sound it tells us to make. The use of sandpaper letters for the child to trace their forms. Intermediate language work consists of blending the individual sounds, lots of three-letter phonetic word building, word matching, word and picture matching, and reading short sentences. Advanced language work involves more handwriting, reading books, learning four-letter word blends, silent e words, and some phonograms too. Mathematics – Equipment on the math shelves ranges from teaching 1-10, both numeral recognition and counting, the teen numbers, counting in tens and mastering 1-100. Then the work leads up to the decimal system exploring numerals and quantities up to 10,000. Along the way the children acquire the understanding of addition, subtraction, multiplication, division, and dynamic math. 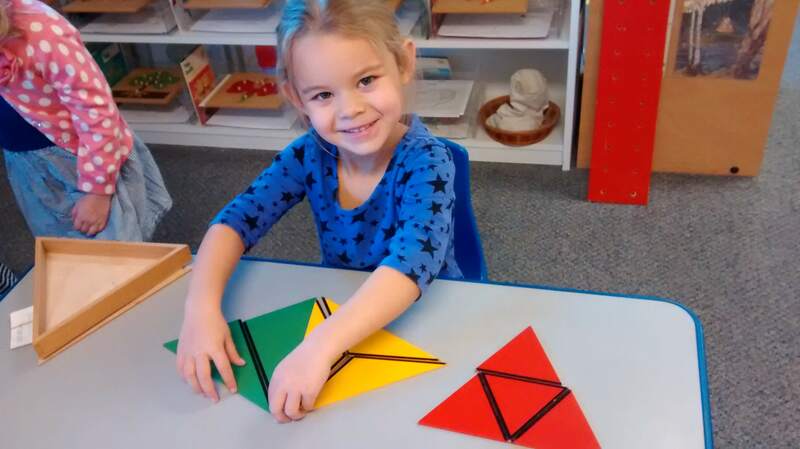 The Montessori math equipment is excellent and includes the geometric cabinet with a study of the geometric solids. 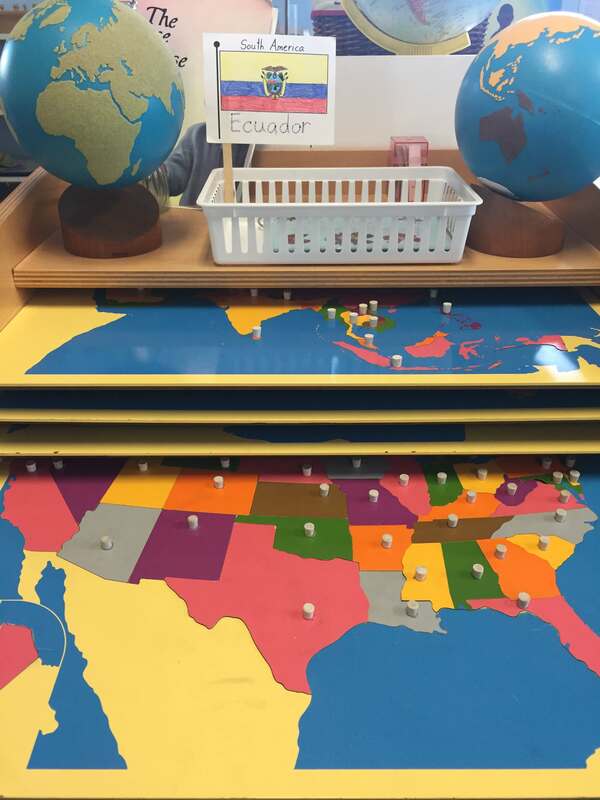 Geography, in the Montessori classroom, is a constant study. From learning about the geography of our human body, and then extending outward, to learn about different types of homes, our city of Boise, our state, our country, our continent, other continents, and land and water study. Within a school year we travel from the human body to outer space! The children make their own maps using the Montessori materials, and get a deep understanding of their place in our world. Additionally there is a specific geography area, which includes puzzle maps of the earth, all six continents, and the United States. Globes and various world studies add to this geography unit.